If you’re a Sirius subscriber, you’ll be glad to hear that the Sirius app for Android was released today! I’ve been listening to online radio on my Nexus One for the past few hours, and have come across no problems. Subscribers can get the app and login with their credentials to start listening to their favorite channels, and those of you who haven’t got a subscription for the service will be offered a 7 day free trial upon installation. 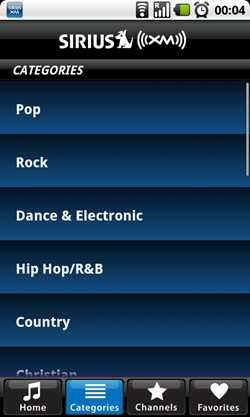 The layout of the app is similar to that of the Sirius iPhone application, with tabs at the bottom of the screen making it simple to navigate between categories and channels. 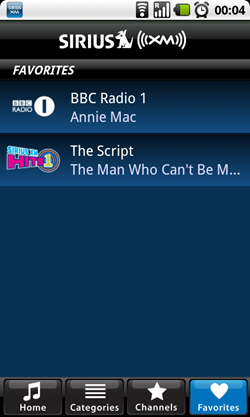 You can view what’s currently playing on the ‘Home’ tab, whereas ‘Categories’ and ‘Channels’ allow you to see what’s on and pick a station. Of course, you also have access to your favorite channels too. 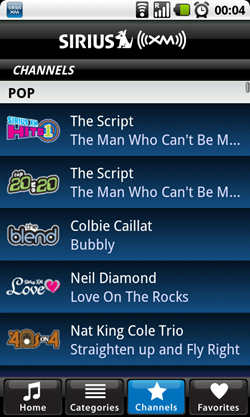 SIRIUS & XM offer all of the channels for which we have mobile performance rights. 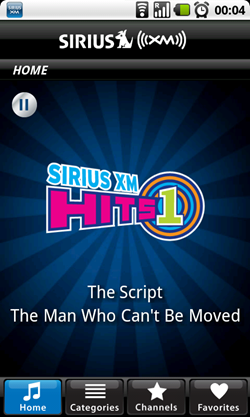 For that reason, certain channels which may be available on your satellite radio or online radio service may not be available on your mobile device. I’ve managed to use the app without any problems on both a Nexus One and G1, so you should be able to install Sirius regardless of the version of Android you’re currently running. I couldn’t find it in the market, but Sirius offers to e-mail you an installation link. I would have liked to see some sort of search function within the app, so I could search for channels instead of having to scroll down the entire list. 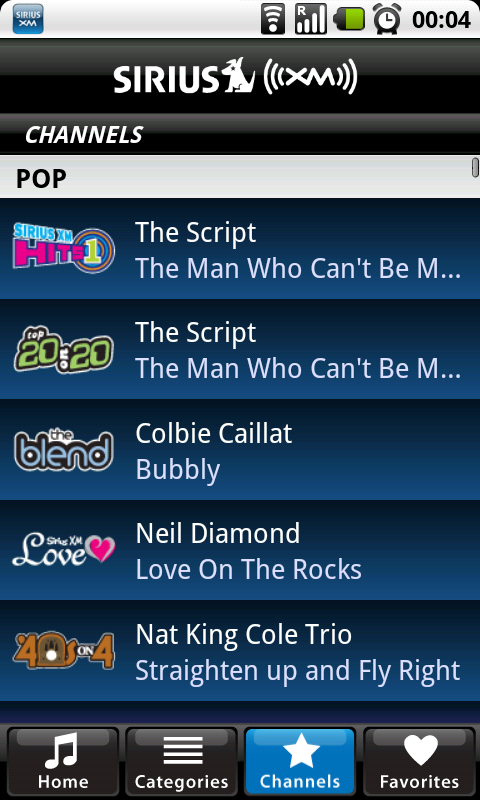 Nevertheless, Sirius is a great app for Android, and makes listening to online radio on your phone a whole lot easier.